Even fits over regular sized heads! How do you ever plan to rule an entire kingdom without the right hairstyle? The Red Queen from Tim Burton's Through the Looking Glass, now that's a lady with a hairdo that can keep a kingdom under control! She wanted to keep her hair stylist a secret from all of her subjects and especially her beloved little sister, the White Queen, so naturally she had the hairdresser beheaded. 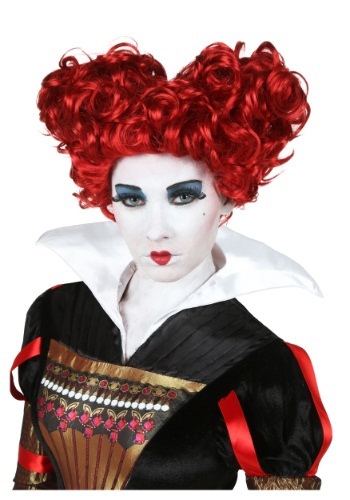 Up until now her secret had been kept safe, but now you can shout, “Off with their heads” and look like you mean business when you wear this Adult Deluxe Red Queen Wig! This lovely blood red wig is as beautiful as they come, with curly red tresses sitting ever so elegantly in the shape of a heart you will have a royal coiffure that won't quit. Never concern your tiny head with worries of even a single hair going out of place while you shout out orders to all of your subjects.